The entrance to 305 Decatur St., where residents say they've struggled without heat through the latest cold snap. 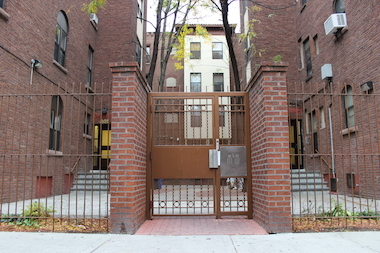 BEDFORD-STUYVESANT — Residents of a Section 8 building in Bed-Stuy that has had more than a decade of heating problems are freezing again — just weeks after management claimed to have fixed the problem. Shinda Management Corp., which took over 305 Decatur St. in 2005, finally began installing baseboard heating late last year after residents said they'd gone years without a functional heating system, as DNAinfo New York previously reported. But as temperatures plunged into single digits over the past few days, the makeshift heating system wasn't up to the task, residents said. "We're freezing," said Collette Wright. "This baseboard heating is not working out." Temperatures reached as low as 4 degrees this month in some parts of the city. Thursday's low was just 9 degrees, with 15 degrees expected for Friday. Despite complaints, residents said there's no sign that Shinda will fix the heat anytime soon. The building's superintendent went door to door on Thursday taping up window cracks, but made no mention of when the heating system would be fixed, Wright said. Repeated calls to Shinda's offices from DNAinfo New York went unanswered. The building's heat was supposed to be fixed in 2008, according to a letter from the city Department of Housing Preservation and Development. The letter discussed a loan program in which Shinda would make a number of fixes to its properties, including replacing the boilers at 305 Decatur St. But it wasn't until last year that Shinda was finally able to address the problem, adding baseboard heating to residents' apartments as a solution to the building's "unevenly distributed" heat, according to HPD. Down the hall from Wright, another tenant, Linda Owens, said she was happy when Shinda finally added baseboard heating to her apartment — before the temperatures dropped. "They did what they said they were going to do, but it's not working," said Owens. "Maybe they need to turn it up more." Owens said she spends most of her days in fleece pajamas to stay warm. She said she's even resorted to a risky technique the FDNY recommends against based on the danger of fire and carbon monoxide poisoning. "I'm burning my stove all day," she said. "The colder it gets, the more you don't feel the heat."